How time flies. My carbon steel skillet arrived on 23 January of this year. It was shiny and new (well, duh, of course it was). And I thought with just about a year's use under my belt, it was time for an update. Below are current photos. It's built up an amazing, dark seasoning, just as you'd hope it would with repeated use and moderate care. 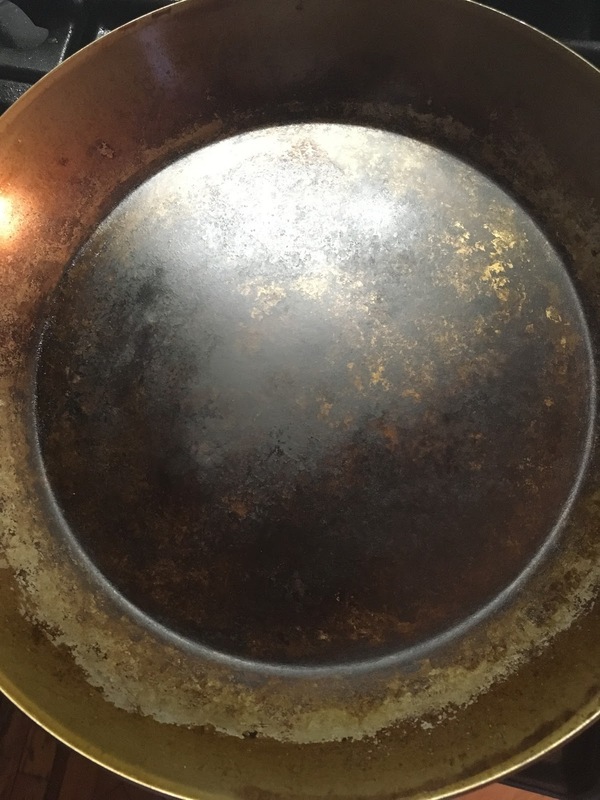 For the first few months I diligently oiled and heated and wiped it as part of the cleaning process each time I used it. But at this point it really doesn't need that any more. It is absolutely my go-to skillet, and it works like a charm. It conducts heat beautifully, is practically nonstick (I don't really like fried eggs, but sometimes I'll cook a fried egg in it just to watch it slide out), a breeze to clean, and generally has been one of my best kitchen investments ever. 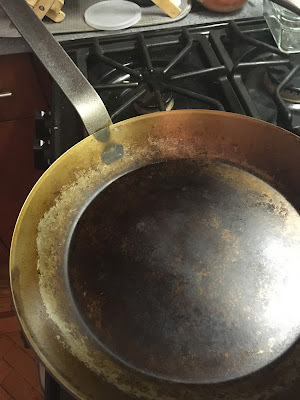 Once again my hat is off to Cook's Illustrated, without whom I would still be sauteeing in ignorance, not realizing there is a third way between the fussiness of cast iron and the delicateness of nonstick.